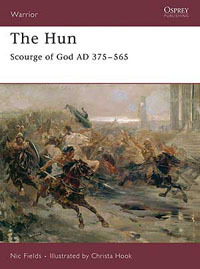 The Huns were the most feared barbarians of the Ancient world, known to their Roman enemies as the "scourge of god". Superb horsemen and excellent archers, they fought with a reflex composite-bow that could penetrate armour at 100 metres. In battle they would rush into the fray with surprising speed and apparent chaos, maintaining an incessant barrage until the enemy was sufficiently weakened, thus their very name came to epitomise swift, merciless destruction. This book explores the rise of the Huns and their development in terms of equipment, tactics and society, from their first attacks on the Goths to the death of the Emperor Justinian, including the great battle of Chalons and the reign of Attila.